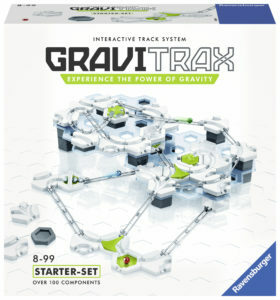 Build, test and race against gravity with Ravensburger’s unique STEM toy GraviTrax. The GraviTrax construction set is a modern-day spin on the classic marble run. Offering an extensive track system and fun accessories, it provides endless possibilities and challenges for any STEM or building enthusiast. Adjust and control the speed with customizable track heights, and then release three marbles simultaneously to let gravity, magnetism and kinetics drive their fates, as they race through the tracks and test your design. 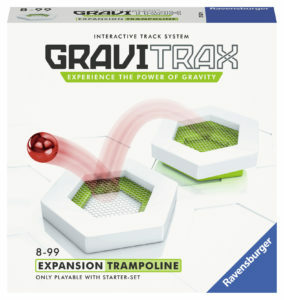 This spring, Ravensburger adds three new accessories to the GraviTrax line. The Lifter expansion accessory is a button operated elevator that can raise the marble back up by two levels. The Scoop accessory picks up the marble, swings like a trebuchet, and propels the marble down the track of the next track of the next highest level when triggered automatically. The Trampoline accessory changes the pace from racing to bouncing with specially angled height tiles and springy trampoline tiles.